There’s an old Chinese saying: Firewood, rice, oil, salt, sauce, vinegar and tea are the seven necessities to begin a day. For many of us tea would be higher on our list of early-morning priorities, and it’s an ancient Chinese ruler, Yan Di, that we have to thank for it. Often described as the father of herbal medicine, Yan Di spent his lifetime investigating - by tasting - plants to determine if they had any beneficial properties. He discovered, round about 2737 B.C., that tea made a good antidote to those that were decidedly unbeneficial! Tea gradually moved on from being simply a herbal medicine to a religious offering to a vegetable and, finally, to a refreshing drink. It was during the Ming Dynasty that foundations were laid for today’s style of tea-processing and drinking. There are four different types of tea. The differences result from the age of the leaves when picked and whether oxidation has taken place. If the leaves are crushed, bruised or broken, enzymes in the tea leaves are exposed to the air and this leads to varying degrees of oxidation. White tea: a rare variety using very young leaves and buds. Green: the leaves of the tea plant are dried immediately and completely after picking to prevent oxidation. 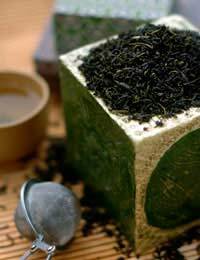 Gunpowder is an example of green tea. Black: the leaves are exposed and fully oxidised (resulting in the black colour). Souchong is an example of black tea. Oolong: somewhere between black and green with partial oxidation. Boil water in a kettle. Just before it boils, pour some in the teapot and swish it around to warm the pot while the kettle is brought fully to the boil. Add 1 teaspoon of tea per person allowing one extra ‘for the pot’. As soon as the water boils, pour it straight onto the tea. Put on the lid and a tea cosy. Allow to stand for 5 minutes. You can use tea-bags, in which case, stand for 4 minutes. (2-3 cups a day are said to relieve water retention)Add 1 spoonful dried blackcurrant leaves to about 8 fl oz water in a small pan. Bring to the boil and simmer for 2-3 minutes. Allow to stand, covered, for 10 minutes before drinking. (A cup after meals is said to aid digestion)Pour a cup of hot water over 5 fresh mint leaves. Leave to stand, covered, for 5 minutes before drinking. (Good for digestion)Pour boiling water onto 2 slices of root ginger in a mug. Allow to stand for 3-5 minutes and strain before drinking. GreenResearch has shown that green tea contains a powerful anti-oxidant. Although more research is needed, it is possible that it plays a part in the body’s fight against bad cholesterol, heart disease and even some cancers. OolongOften drunk in Chinese households at the end of a meal, it is said to aid digestion. It stimulates the metabolism helping the body break down food more quickly. It’s also alkaline so good for people with ulcers. BlackFor a long time it was thought that only green tea had any health benefits but new research suggests that black tea is rich in other health-giving compounds. Buy good quality tea. Keep in an airtight tin in a cool dry place away from direct sunlight. If you have several varieties of tea, keep separate to avoid cross-contamination. Another old Chinese legend involves a great Zen master who was questioned by three monks of differing rank and authority. To each one he gave the same reply: ‘Go and have your drink of tea.’ There should be no inequality: we are all born equal.